Separation and divorce are difficult at any time of the year. Add holiday stresses to the mix and it can quickly become even more overwhelming than it already is. If you are navigating a separation or divorce, claim the following gifts for yourself. If you’re looking to help a divorcing family, encourage them to think about these things and support them in their decisions. 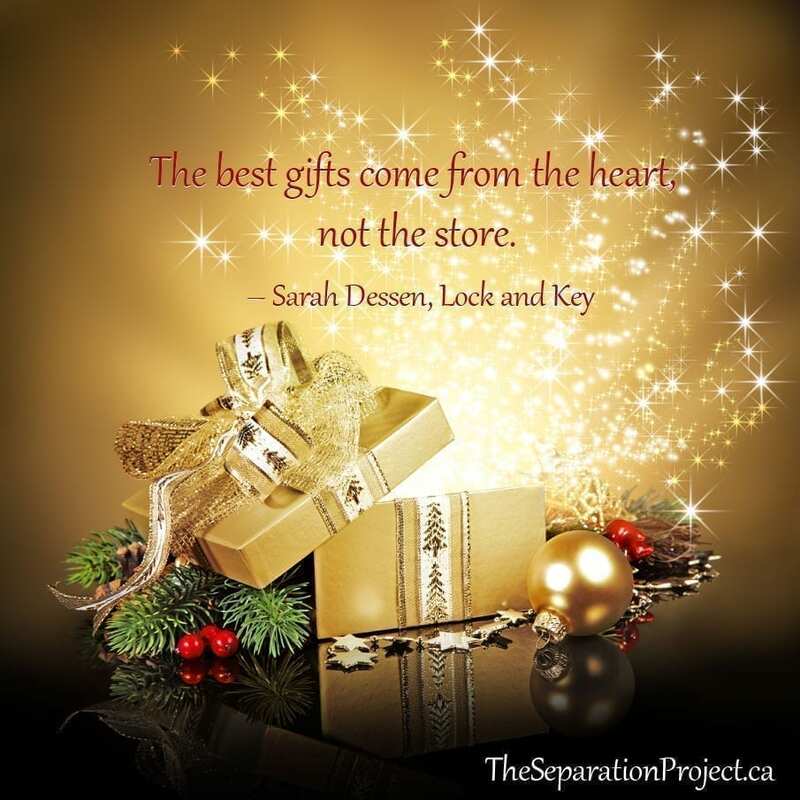 What is the best gift you could give yourself, or a family member who is navigating a separation? Simplify the holidays so you can rest and rejuvenate. For example, just because you always have a large gathering of friends and family doesn’t mean you have to do it this year. Take a break if you want to. Do what gives you energy, not what drains it. Letting the holidays unfold with many expectations is a set-up for disappointment. Go with the flow this year and keep a good sense of humour! Everything will be different. Change is the only thing that we can really count on in life. Fighting change is not productive and a very large energy drain. Try instead to influence the changes into something positive for you and your family. You can also keep old traditions that do work and modify them as needed, but creating new traditions can be a lot of fun. When you are grateful, you remain positive and keep hope alive. Do not dwell on what you do not have. Be thankful for what you have right now and what you did have in the past. Remember the future is full of new possibilities. What is the best gift you could give children, yours or not, who are faced with parents divorcing? As a parent or family member, be thoughtful of the children caught in the middle of a divorcing couple. Speak respectfully about both parents or be quiet. Allowing children to love, honour and cherish both their parents and their memories of both their parents, is a true gift. Note that this is true for children of divorce at any age. Even adult children do not need to hear what you really think of their ‘bad’ parent. It only makes you look judgmental. Feel free to hush family members that are less aware of the harm they are causing. Protect the kids! Do not try to compete with the other side of the family with gift giving or having a ‘better’ time. Let the children enjoy both parents and families without any attached guilt or justification. Be glad if the kids have two families that can be there for them. No one can ever have too much love and connection with others. Invest in quality time with the children, especially at this difficult time. Many of us have more than enough material possessions – book some time and enjoy just being together. The amount of money spent is not the object – it is being truly attentive and present. Do something fun together. What do you remember the most about Christmas – the moments with family and friends, or what was under the tree? Gifts that are experiences, like lessons or tickets to things that will help children grow and learn, are far better than shiny new possessions. These gifts of experiences, if done thoughtfully, will be appreciated for years to come and will not end up in a landfill site. Make certain you understand what the child’s interests and needs are first and choose well. Encourage new interests. Float the idea with others if you want to contribute towards something more expensive and need help funding something, or ask the parents how you can contribute towards a hobby or sport so it fits your budget. Divorcing individuals usually find themselves with 30-40% of the budget they had as a couple, so the help may make a big difference to the lives of the children. Happy Holidays! Merry Christmas and all the best! If you are finding things difficult please consider divorce coaching! I can help you feel more in control and less overwhelmed! Great advice Pam! I think embracing the inevitability of change and creating your own new traditions and memories is so important. It’s something me and my daughters did and we now celebrate Christmas in a slightly different but very happy and fun way. Merry Christmas to you and your family.